26 lbs (275 loads!) 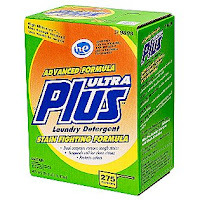 Ultra Plus Laundry Detergent only $13.49 w/ FREE Store Pickup! Wow, you can get 26-pounds of Ultra Plus Laundry Detergent (that's 275 loads!) for only $13.49 with free store pickup at Sears! NOTE: The correct price will not show until you go to checkout, where it will drop from $26.99 to $13.49. You must select store pickup to get this price. If you need more, you can also buy buy 4 boxes for $53.96 and use code SEARS2012 to cut your total to $48.96 for 105 lbs. This detergent has a 4.5/5 rating, so it seems like good stuff and well worth the price!